"It is gratifying to hear from my patients that they are back to enjoying the activities they love." Dr. John D. Ramirez Jr. is board certified by the National Board of Chiropractic Examiners (NBCE), and the American Board of Chiropractic Neurology (ACNB). Dr. Ramirez focuses on restoring function and mobility for patients who experience headaches, imbalance and sensory loss, and back and neck pain as well as for patients who are recovering from surgery. 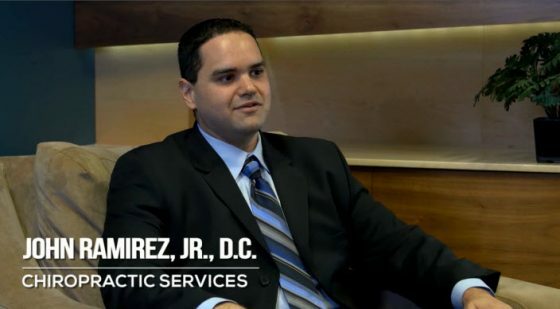 Following his undergraduate studies at the University of South Florida, Dr. Ramirez earned his chiropractic degree from Palmer College of Chiropractic. During his time at Palmer College Dr. Ramirez also completed 300 hours of additional study in Clinical and Functional Neurology at the Carrick Institute for Graduate Studies and 150 hours in Electrodiagnostics at the Neuro Diagnostics Institute. He then pursued board certification in chiropractic neurology in which he obtained his Diplomate in the American Board of Chiropractic Neurology (DABCN). In addition to his education, Dr. Ramirez’s experience extends to working as a chiropractor in the Tampa Bay area and completing an internship at Florida Orthopaedic Institute in 2013, working under Dr. Reina. Dr. Ramirez is a certified Functional Training Specialist and Personal Trainer from the International Sports and Fitness Trainers Association. 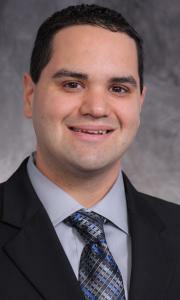 In 2013, Dr. Ramirez was awarded the Clinical Service Award for dedicated commitment and service to patients. He is a member of the Florida Chiropractic Association, American Chiropractic Association and Hillsborough County Chiropractic Society. In his spare time, Dr. Ramirez enjoys trap shooting, intramural sports and has a black belt in Taw Kwon Do. Dr. Ramirez is very thorough and helpful. He is my top two of chiropractic physicians that I have seen, which number 10 or more. He is very interest and concerned with the success of the treatments he does. I couldn’t be more pleased with Dr. Ramirez. Dr. Ramirez has helped me considerably with my lower back pain. He provides excellent guidance and understanding into my condition as well as adjustments that help me feel better. 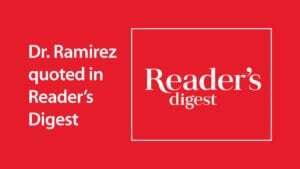 I trust Dr. Ramirez and respect his opinion. Dr. Ramirez is a genuine caring listener. He takes time with me every visit. He shares his knowledge and does his best to get me healthy. He stands out as an EXCELLENT doctor. Dr. Ramirez is the best in his field. He goes above and beyond to treat all his patients with total compassion. He is genuinely concerned for each of his patients’ personal ailments. He is gentle while adjusting my painful muscles and tendons and I always feel much better after he adjusts what needs to be treated. Dr. Ramirez is my favorite doctor and I highly recommend his services to everyone. If you are seeking a physician that is caring, informed and professional, then I highly recommend Dr. Ramirez. He looked at what he thought could be impeding my progress. His ability to utilize different techniques has had a very positive effect resulting in my gaining additional range of motion with less pain. Dr. Ramirez has been the catalyst to move me further toward my goal of regaining range of motion. I had a proximal humerus break in my left humerus in Feb 2016. I did not have surgery initially and went through physical therapy to try to regain my range of motion. Unfortunately, scar tissue formed and I had to have an arthroscopic release in Jun 2017 and continue physical therapy. The therapists have been excellent at continual manipulation but progress was limited. I had Dr. Ramirez look at what he thought could be impeding my progress. His ability to utilized different techniques have had a very positive effect, resulting in my gaining additional range of motion with less pain. It has been a long road to recovery but I could not have completed it without the dedicated staff at Florida Orthopaedic Institute. Dr. Ramirez has been the catalyst to move me further toward my goal of regaining range of motion. Everyone at the FOI Bloomingdale Therapy center is GREAT – from the office staff to the professional therapists to the staff physician, Dr. John Ramirez. They are always so helpful and pleasant. Even though this has been a trying experience, they made it as pleasant and fun as possible. The number 1 priority of the Bloomingdale team is always focused on your well being and helping you recover from your injury. Following my Total Knee Replacement, I had quite a bit of discomfort in my pelvis, thighs and buttocks. Dr. Bernasek’s associates suggested I may benefit from working with FOI’s chiropractors, Dr. Ramirez and Dr. Reina to expedite my recovery. I worked with Dr. John Ramirez for a few visits and found him to be a great help. He studied my X-rays and discovered my Sacroilliac joint and pelvis were a bit out of whack. With Dr. Ramirez’s exercises and gentle pressure, I have made good progress. I intend to continue strengthening my core. I am very grateful for his kind, gentle and oh so thoughtful professional care. He’s a great fellow! As someone who lives with extreme hyper-mobility, like Cirque de Soleil performers, I have avoided seeing a chiropractor all my life. Keeping my joints in place is a goal I work hard to achieve, so the thought of someone using brute force to manipulate them is terrifying. However, a vertebra in my neck slipped out of place and, try as I might, I couldn’t get it back where it belonged. So, I went to see a chiropractor. She agreed that she needed to be careful, so she did only the minimum, which didn’t work. Chiropractor #2 threw caution to the wind and not only scared me badly by very roughly manipulating my body, he conceded defeat after working on me for only three minutes. Since a close relative with hyper-mobility spent five years as a patient in the Bloomingdale PT office of FOI, I knew that I could trust the people there to help me without hurting me. After getting a prescription from Dr. Jackson, I saw Dr. Ramirez. He took the time to learn my history, looked at my x-rays, and agreed that hyper-mobility complicated my care. He spent about 45 minutes checking for nerve damage, improving blood flows, and loosening surrounding muscles. Then he very gently turned my head to the side and the vertebra (which had been out for four months), slipped back into place with no pain at all. He then checked out my posture and even my jaw and made additional adjustments, again with no pain. I followed up with PT for several weeks and then saw Dr. Ramirez again. My neck has recovered and I am extremely pleased! I highly recommend this very fine chiropractor.